One online casino that has been gaining loyal customers is the Slots.lv room. Available to both American and Canadian online casino players, Slots.lv offers an above-average collection of table games and slots that come from numerous software providers. 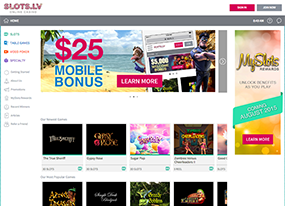 Bonuses are what Slots.lv take seriously, offering members many sign-up and re-load freebies. Players can get as much as $5000 in welcome bonus cash, and another $2000 can be earned for playing certain games. Slots.lv also offers special daily and monthly bonus options as well as a VIP Rewards program. Slots.lv offers service to all North American players so extra attention is given to banking options for players. Deposits can be made through Visa credit card, money transfer, or the many other methods available for ease of deposit and withdrawal for both American and Canadian online gamers. Slots.lv is a slots casino first, offering many progressive jackpots at any time. Jackpots are in the six-figure and seven-figure range and payout percentages are at the top of the industry. Games have been audited to be fair and random, and play is fast and smooth. Powered by a combination of Real Time Gaming, proprietary software, and other providers, a wide selection of games are created for members, and 3D slot games offer state-of-the-art graphics and sound effects for an online casino experience that rivals any in the industry. The Loyalty Program at Slots.lv comes with automatic entry and is fed by the amount of action each player enjoys. The more you play the more cash rewards you will see automatically deposited into your account every two weeks. The mobile casino at Slots.lv is both Android and iOS friendly, requiring no download to play. Games can be played anywhere at any time on phones or other mobile devices. Many big-name slot games are available in the mobile casino, as well as table games like roulette and blackjack. The mobile casino at Slots.lv is always expanding its game selection and intends to continue to offer an impressive variety of games. Slots.lv currently offers a $21 no-deposit bonus for any players that want to try the mobile games out before investing any of their money. If they like the action, they will still be able to take advantage of the generous deposit bonuses available at the casino. Slots.lv also offers different mobile bonuses from time to time.